The Stable Screen with Sound Transmission! Structurally stable front projection screen. Ideal for large screen applications. Perforated for sound transmission. The front projection screen SCENE PERFORATED has the same technical features and applications as the SCENE screen along with being perforated for sound transmission. 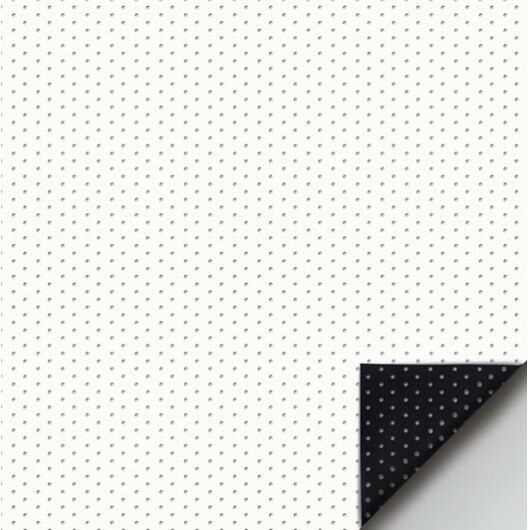 With a perforation of 57,000 holes per square meter (37 holes per square inch), a perforation diameter of 1.25 mm and approximately 7 % perforation area, the perforated projection screen SCENE PERFORATED appears as a solid surface at just a few meters of viewing distance. For shorter viewing distances, we recommend a microperforated screen.